This set of cyclist-pleasing coasters is crafted from reclaimed bicycle chain and bamboo. 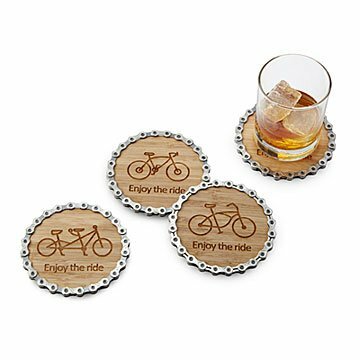 Whether you're quenching your thirst after a great ride or putting your feet up and watching the Tour de France on TV, this coaster set is a handy beverage companion. Graham Bergh crafts these road-worthy coasters from reclaimed bike chain and bamboo with protective cork bottoms. Each one features the image of a different bike—mountain, cruiser, ten-speed, and tandem—for a functional survey of favorite two-wheeled types. Each month, Graham's workshop collects 3,000 pounds of used bike parts, drawing from 150 shops in 17 states. The parts that still have life in them are donated to a local non-profit group that teaches bicycle repair to children, but the rest are transformed into coasters, bottle openers, and other functional designs by Graham's talented team of craftsmen. Handmade in Mosier, Oregon. Good item to keep on the table for everyday use. These were better than I anticipated! Always find the perfect gift at Uncommon Goods! Fun to leave out for guests to use. Protects wood surfaces. Nice product for insane triathlete and his great wife who likes her furniture! USE A COASTER, doggone it! These coasters are beautiful! The craftsmanship is awesome! I wanted to get a special gift, and I've achieved that!! Gave as a gift .They used them on Christmas Day .A big hit. Love the recycled component, and the design. Also love the story that comes with them.